Established for over 25 years, ElectroMech Agri Ltd is Ireland’s premier dairy parlour equipment supplier, installer, retailer, service provider and support centre. According to managing director Gary McLean, the Co. Tyrone-based company has experienced its biggest growth south of the border where there is a great demand for BouMatic’s external rotary milking parlours. ElectroMech are exclusive BouMatic milking equipment distributors for Northern Ireland, Scotland and North England, but since the abolition of the milk quotas in 2015, they have made big inroads in the Republic of Ireland market. With the average herd size in the Republic now around the 100-mark, more and more dairy farmers are opting for BouMatic’s class-leading external rotary milking systems and are enlisting the services of ElectroMech to install them. “Our south of Ireland customer-base has increased dramatically since the lifting of the quotas three years ago,” Gary reveals. “We’re getting a lot of enquiries from the Cork area in particular. We installed our first external rotary parlour in Dripsey last year. BouMatic’s external rotary equipment suits the bigger dairy farmer. It’s designed specifically for the new breed of Irish dairy farmer who is milking a large number of cows. ElectroMech works closely with Boumatic Gascoigne Melotte in Athy, Co. Kildare who are their counterparts in the Republic of Ireland. BouMatic’s Xcalibur 360EX is regarded as the ultimate in rotary milking systems. Built for continuous, around-the-clock milking, it is rugged and precision engineered to deliver unrivalled throughput and maximum efficiency for your dairy operation. Its drive system, central pivot and swivel, nylon rollers and massive double I-beam drive rail are the roughest and most reliable in the business. A contemporary, robust design and rugged construction gives the Xcalibur 360EX lasting durability and value. This rotary, available in a basement version from 40 to 80 stalls and non-basement from 32 to 44 stalls, is ideal for herds of over 1,000 cows. 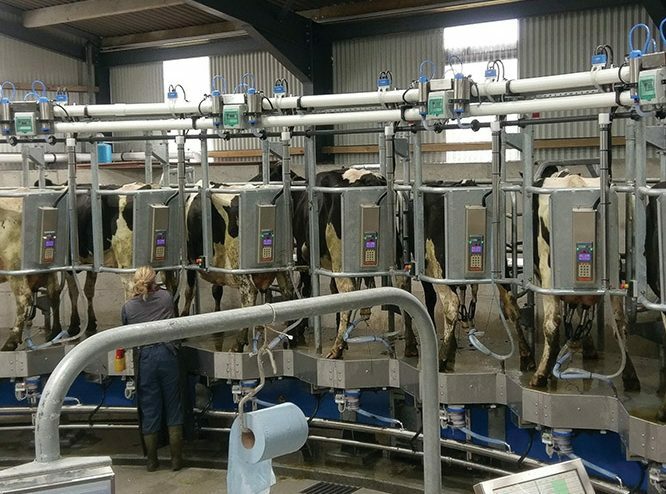 The Xpedia 360EX system would appeal more to ElectroMech’s customers as it is specially designed for family dairy farms, enabling the producer to milk on his own and to carry out a whole range of interactions with his herd. With 24 to 30 stalls, it is the ideal platform for herds with 80 to 300 cows. The Xpedia 360IX and Streamline 360EX are the other platforms in the BouMatic external rotary range. Combining the best of parallel, herringbone and tandem designs, the Xpedia 360IX provides the most relaxed milking and quickest entrance and exit traffic. Premium comfort and safety for the cows as well as for the milker is combined with system efficiency to ensure the highest quality of the end product. This system can milk 50 to 800 cows and the platform is available for 16 to 40 stalls, reducing milking time and operator labour costs. From 80 to 200 cows per hour, you can reach exceptional operator performance. Like the Xpedia 360EX, the Xpedia 360IX is especially suited to the Irish market. The Streamline 360EX external rotary milking platform is designed for commercial dairy farms and large family farms milking 250 to 2,000 cows. The uncluttered platform design with integrated cabinets at each stall is the foundation of the Streamline 360EX’s innovative concept. BouMatic is a global leader in the design, manufacture and supply of the highest quality milking systems and dairy farm equipment, including milking parlours, herd management systems, milk cooling systems, dairy hygiene chemicals, udder healthcare products, hoof care products, dairy supplies and dairy equipment spare parts. Recognised for its innovative dairy farm products, BouMatic is dedicated to ensuring that dairy farmers throughout the world have the ability to produce the highest quality milk most efficiency, profitably and responsibly. As BouMatic dealers, ElectroMech offers dairy farmers across Ireland the highest levels of service, maintenance and support in all aspects of modern and traditional dairy farming for both large and small herds. Founded in 1992 by Gary’s father Jim, ElectroMech’s head office is located in Dungannon, while it opened a second office in Dumfries, Scotland four years ago. The company employs 15 staff directly comprising milking machine technicians, sales and administration personnel. It employs a further five milking machine technicians on a sub-contract basis. ElectroMech’s expertise in dairy farm management and systems ensures it provides dairy farmers with everything they require to keep their farm milking, efficient, cost-effective and profitable. The family-run business offers a comprehensive range of BouMatic milking parlours and equipment as well as full installation combined with a large portfolio of additional dairy products and services such as stall work, slurry handling, dairy chemicals and hygiene (including mastitis advice), energy saving solutions, 24-hour 365-day callout, equipment servicing, parlour updates and bespoke fabrication. In addition, ElectoMech manufactures bespoke parts which are tailored for Irish milking systems. Gary concludes by thanking ElectroMech’s customers for their business and continued support.